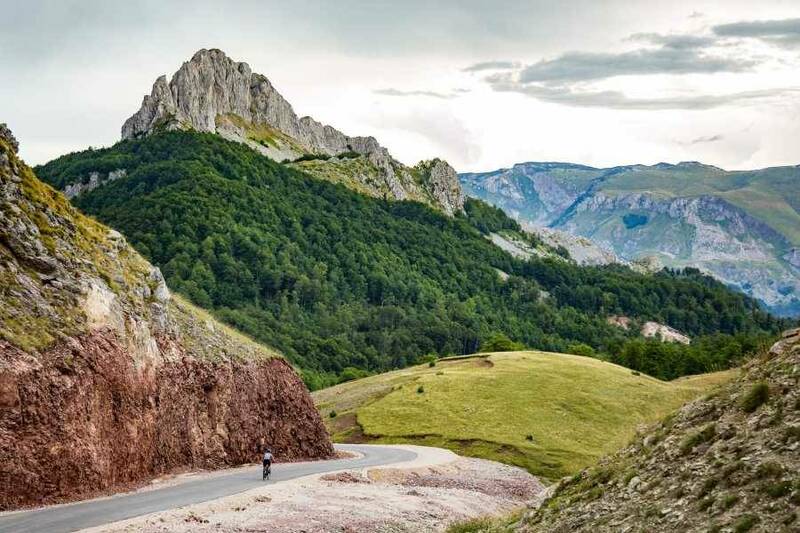 A great combination of hiking, biking on Bjelašnica and Visočica Mountain ranges and rafting through the Neretva Canyon. Come with us to Bjelašnica’s hidden highland villages, and enjoy a rare view of the emerald of Herzegovina flowing over 100 kilometres from its source into the Adriatic sea. Expect deep canyon walls, endemic flora and fauna, and a wild and pristine ambiance that only the Neretva can provide. You should be reasonably fit for this one and it requires some biking experience! 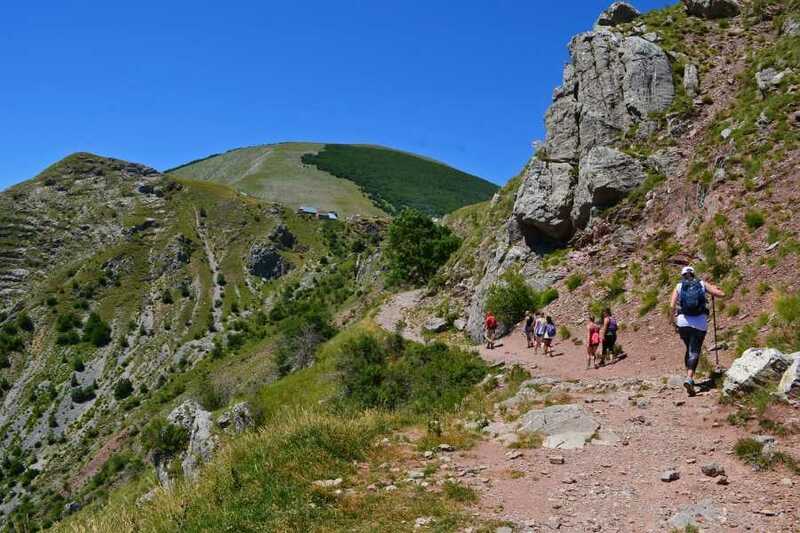 Transfer from Sarajevo to Umoljani highland village, with a full day walk in the Bjelasnica Mountains, home of the 1984 Winter Olympics, ascending Obalj peak (1,896m) and visiting Lukomir, Bosnia and Herzegovina’s highest village (1,469m). From the traditional style Bosnian Mosque in the village of Umoljani, we walk to the Gradina, summer village which locals of this area used for centuries as their base for summer pastures. From here we will start ascending toward Obalj ridge and slowly we will rise above Studeni potok (Studeni stream). The views will start to open in front of us. The mountains south of us, Treskavica and Visocica will offer us fantastic and breathtaking scenes. Once we reach the slopes of Obalj, we will slowly continue and progress to the summit itself. From the peak we’ll see Lukomir village below us where we will descend from the top. Lukomir is Bosnia’s highest village at 1,469m, with its ancient stecci (mediaeval tombstones) where villagers still follow a traditional shepherd way of life. 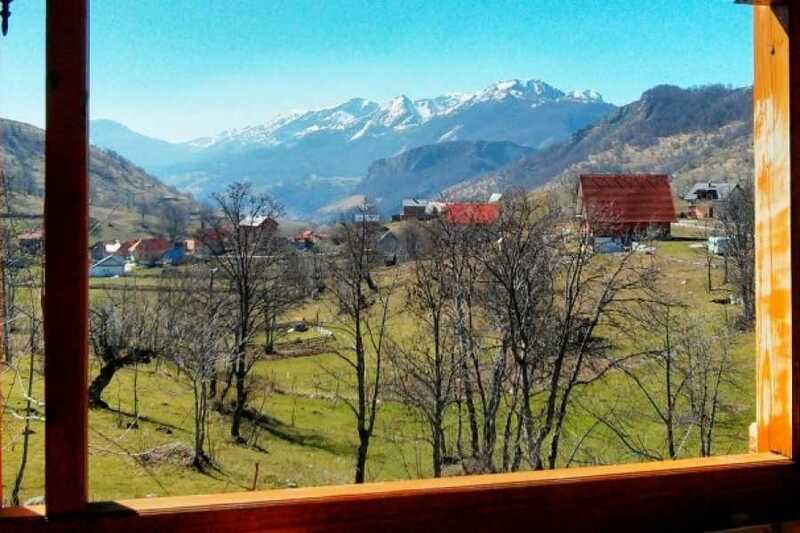 On the edge of the village there is a fabulous view of Rakitnica canyon, Obalj and Visocica. After a simple but tasty homemade late lunch we hike back via alternative route back to our accommodation at Umoljani Village. 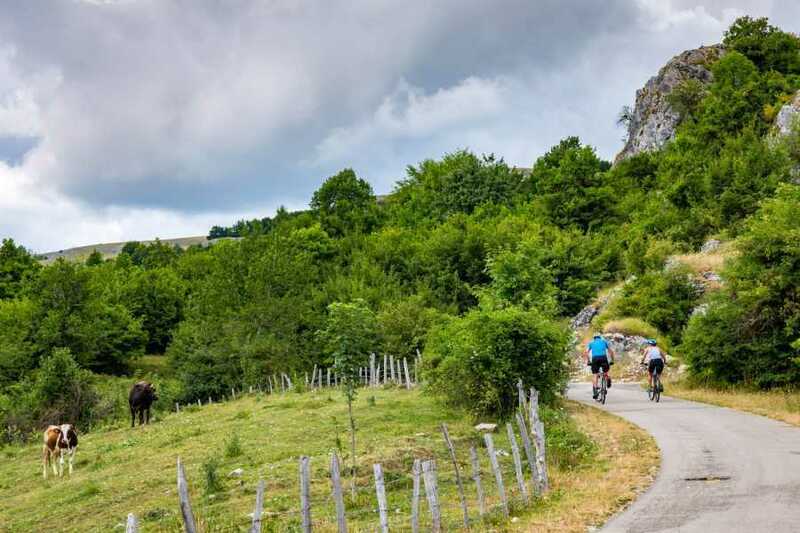 Full day biking in the Bjelašnica and Visočica mountains down to Boračko Lake, over two mountain passes on recently paved road, with magnificent views of Prenj and its peaks. Highlight is amazing downhill ride to valley on the other side of Visocica mountain and Neretva river. 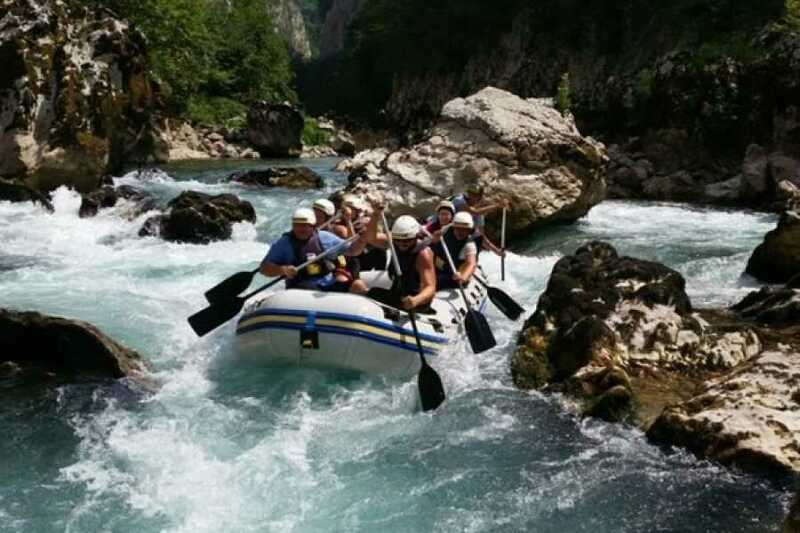 We end our three day Adventure with rafting deep down into the Neretva Canyon. Walking Conditions: This trek includes a one day walk through moderate terrain, where you will need to carry a day backpack. We will walk between 6 to 7 hours, with a picnic lunch taken on the way. The trails are not well maintained and not well marked. The paths are often rough and stony underfoot. The walk involves steady ascents and descents (maximum 300 meters). Biking Conditions: A full day of Mountain biking over 60km of road cycling. You will be provided with good quality mountain bikes, with road tires, as well as enjoy the company of your experienced guide. Rafting Conditions: The rafting includes 3 to 4 hours of rafting through 23 km of unspoilt canyon. you will be provided with all necessary safety gear, and a wet suit. What is included: Transport from Sarajevo to location and back, accommodation (mountain chalet at Umoljani Village and Boracko lake), transport of gear to Boracko lake, all meals (breakfast on day 2 & 3, lunch on day 1, 2 & 3, and dinner on day 1 & 2), one/two fully equipped and experienced mountain hiking, biking and rafting guides, Rental of Specialized Rockhopper Comp 2015/2016 Mountain bikes, Rafting with all safety gear & VAT. What is not included: Cycling helmets, water bottles, optional tipping to leader/guide and local staff, souvenirs and items of a personal nature (sodas, alcoholic beverages, etc.). Options: Cycling elmets and water bottles could be provided by Green Visions on request. What to bring: In addition to your “normal” summer walking clothes, you will need the following: Walking shoes, helmet&cycling gear for biking, 1-2 liters of water, hat, sun block, small wash kit, towel, swimming costume, fleece, rain gear, 30 to 40l backpack, pocket knife, change of clothes, and camera.